The British Master Barbers Alliance (BMB) was created to help qualified and highly skilled barbers across the whole of the UK to showcase their talent. Formed by time-served Master Barbers with a wealth of experience across the barbering industry, the alliance aims to promote and enhance the work of skilled British barbers, keeping standards high enough to stand out from the unskilled shops across the country. By offering higher status barbering accreditation, the BMB can help ensure customers know where to go for the very best in barbering. One of the key elements of our brief was to create a new website for the BMB that would promote the alliance’s work to UK barbers, thereby encouraging new members to join. Part of this included a dedicated members’ area where people could sign up for different levels of membership. It was also vital to ensure the work of the alliance was clearly communicated, both for the public and potential members. While much of the content had already been written, our copywriters refined and optimised it for the web, ensuring it was consistent with the aims and branding of the new website. 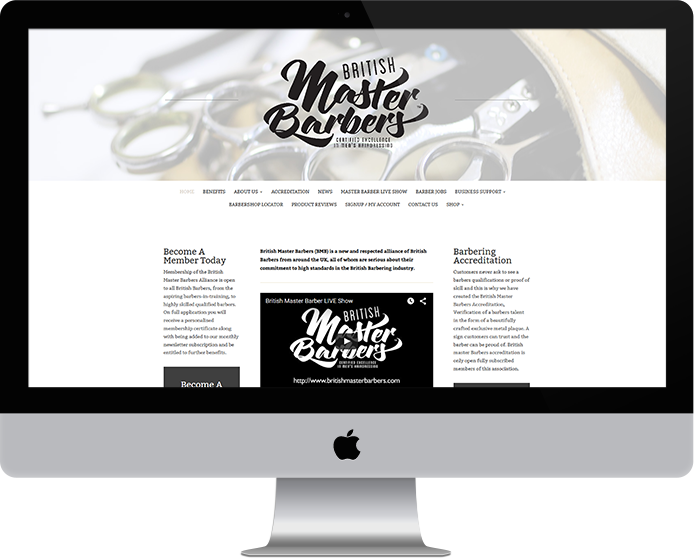 British Master Barbers Alliance now has a powerful new web presence which helps it to promote its work to potential members and the public. cutting-edge design, in keeping with the modern barbering industry.